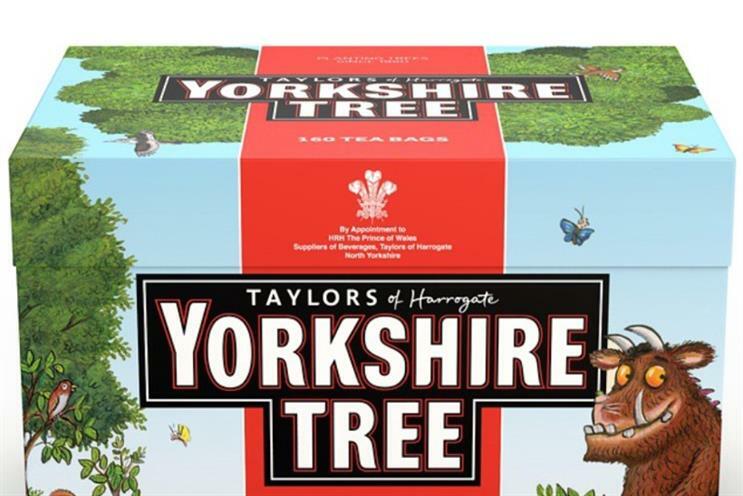 Yorkshire Tea is promising to plant one million trees and has replaced the landscape depicted on its packaging with children's storybook character The Gruffalo. The campaign also includes an app for kids that can be downloaded for free at Apple and Android app stores. Two million limited edition packs will feature an illustration of The Gruffalo, the character conceived by author Julia Donaldson and illustrated by Alex Scheffler. The latter has created a bespoke picture of the monster, which will appear on 80 and 160 SKUs, while Donaldson has penned a bespoke rhyming couplet that will feature on the rear of packs. The brand has also changed its name for the promotion, to ‘Yorkshire Tree’ and pledged to plant one million trees over the next five years. Half of the trees will be planted in the UK, and the remainder in Kenya, one of the places that Yorkshire Tea sources its tea. The promotion is being supported by social media activity using the hashtag #yorkshiretree. Tom Blair, Yorkshire Tea’s brand manager, said: "The character and story of the Gruffalo really brings to life the rationale for the tree planting and we think this will really help us engage the next generation in the importance of trees. "The new pack design will create huge standout on shelf and draw both children and parents alike to Yorkshire Tea, encouraging not only existing tea drinkers to pick up a pack, but also consumers who may never have bought our brand before to add it to their baskets." "This is year one of the pledge, which has seen a half a million pound investment in tree planting and a supporting integrated campaign, of which the new pack forms part of."